Manchester City's Double Gameweek 25 sparked major transfer activity in their players. Sergio Aguero (£11.4m) was the main draw, with more than a quarter of a million managers buying him for the fixtures against Arsenal and Everton. 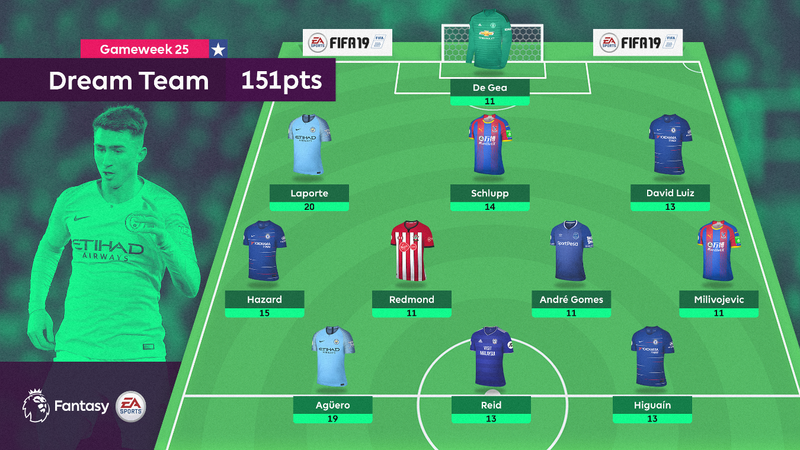 The striker did not disappoint, earning 19 points and a place in the Dream Team. 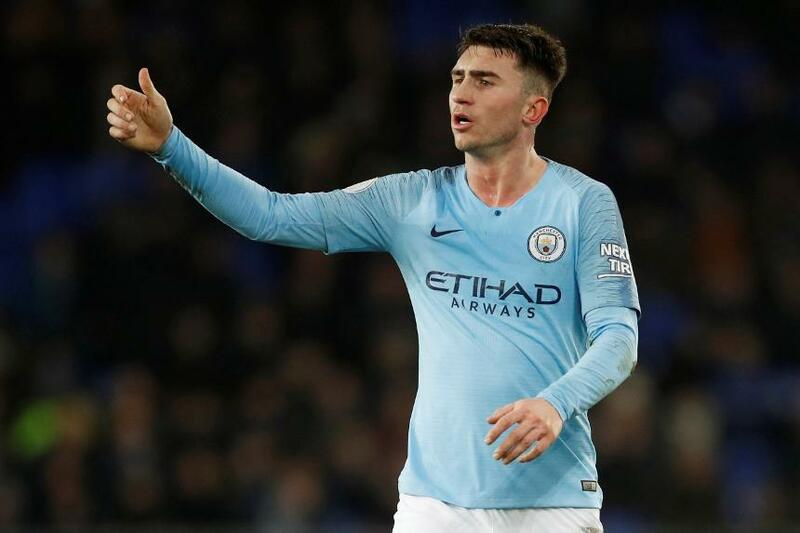 But it was his defensive team-mate Aymeric Laporte (£5.9m) who led the way, bringing in 20 points across the two matches. The pair were two of only three Double Gameweek players to make a Dream Team side that scored 151 points in a 3-4-3 formation. The Manchester United goalkeeper made it three clean sheets from the last five Gameweeks in the hard-fought 1-0 win at Leicester City. De Gea's six stops earned him a combined total of five save and bonus points. The Man City centre-half's first double-digit return of the season came from a little bit of everything. Laporte scored and kept a clean sheet in the 2-0 win at Everton, while providing an assist in the 3-1 win over Arsenal. The key performer from Crystal Palace's 2-0 win over Fulham, Schlupp scored and kept a clean sheet for his first double-figure haul since Gameweek 1. The Brazilian was another defender to earn points from both a shutout and a goal as Chelsea beat Huddersfield Town 5-0. The Chelsea winger has lost more than half a million managers over the last four Gameweeks, but rewarded the 29.2 per cent who remained loyal with two goals and bonus points against the Terriers. The winger scored for Southampton in their 1-1 draw at Burnley. He has featured in every match this season but has produced all of his attacking returns, three goals and two assists, since Gameweek 17. Everton were the other team to have a Double Gameweek 25, and Gomes was the only one of their players to make the Dream Team. His goal in the 3-1 home loss to Wolverhampton Wanderers helped him to his first double-digit return. Milivojevic continued his fine recent form with his seventh goal of the campaign. Five, as well as his one assist for the season, have come since Gameweek 15. The Argentinian blanked in midweek at Everton, but his hat-trick against Arsenal was more than enough for the 980,469 managers who made him their Gameweek 25 captain. The Cardiff City striker doubled his goal output for the season with both strikes in the 2-0 win over AFC Bournemouth. Chelsea's January signing opened his Premier League account with a brace against Huddersfield Town. He also earned maximum bonus points for his 3.0 per cent ownership and is in the top four transfers in for Gameweek 26.